1. Preheat the oven to 220˚C, gas mark 7. Bake the fish fingers on a parchment-lined baking sheet for 15 minutes, until golden and cooked through. Mix the yogurt with the chipotle paste; season and set aside. 2. Meanwhile, put the petits pois in a pan of boiling water and, once they rise to the surface, drain in a sieve. Rinse under the cold tap to cool, shake off the excess water, then tip into a mixing bowl and mash lightly using a potato masher or the back of a fork. Stir through the oil, lemon zest, capers and mint; season. 3. Dry-fry each tortilla in a frying pan set over a medium heat, for 30 seconds on each side, wrapping in foil as you go to keep them warm. Spread each tortilla with spoonfuls of chipotle yogurt and pea salsa. 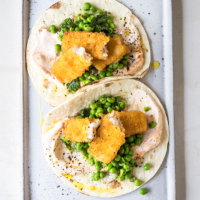 Halve the fish fingers and top each tortilla with 3 halves. Serve 2 tacos per person. Chipotles are smoked and dried jalapeno chillies. Leftover paste can be used to marinate chicken or steak, or try stirring a little into mayonnaise to serve with sweet potato wedges.